I haven’t been writing much at all lately because I haven’t really wanted too, not because I haven’t been doing anything blog-worthy. I’m going to make an effort to write a bit more regularly now. So, let’s get caught up on the events of the past two months, in no particular order. A few weeks ago I went to a baseball game with a co-worker. She is, to put it mildly, obsessed with the game. She’ll rush home after work to watch the game online and she goes to games every weekend that she can. 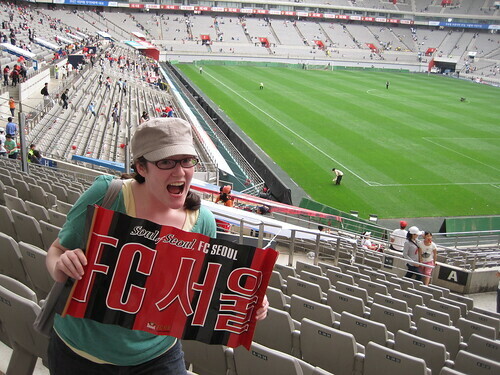 She has even contemplated moving into Seoul so that she can be closer to the stadium. So, I am not exaggerating when I use the word “obsessed.” This worked out well for me because as much as little as I know about baseball in North America, I know even less about the Korean league. My co-worker told me all of the team’s stats and who the best players were, so I at least understood why the crowd went nuts when number 50 went to bat. Although that doesn’t mean that I always knew what was happening. Fortunately, I have a strong imagination. I didn’t take many pictures during the baseball game, but I did manage to snap a pic of Doosan doing a pre-game ho-down. Boring people would call this "stretching." The game was between the Doosan Bears (from Seoul) and the Lotte Giants (from Busan.) Each team had an army of fans that came decked out in jerseys and hats and wielding inflatable clappers. In any other situation, I probably would have found the noise and crowds obnoxious, but in this case it was somewhat infectious. Sadly, Doosan lost. I was mostly sad because only the Lotte fans were doing the wave. It didn’t catch on in our section. Boo. A few weeks later, on Children’s Day, I went to a soccer game with some friends. This time we were watching Seoul FC take on Songnam. The level of intensity was about on par with that of the baseball game. Almost all of the fans wore jerseys and had signs and noisemakers. 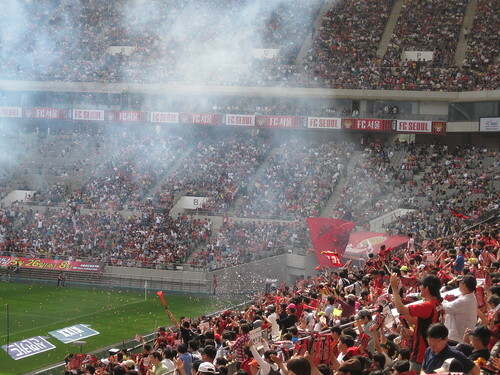 The game took place at World Cup Stadium and had over 60 000 people in attendance, which was a new record for Seoul FC. Like the baseball game, the soccer game had cheerleaders to lead the crowd. However, cheerleaders seemed boring compared to the fireworks. Yes, the soccer game also had fireworks for when Seoul scored a goal. Awesome. And maybe a bit dangerous. Real fans pose with signs they find on the ground after the game. 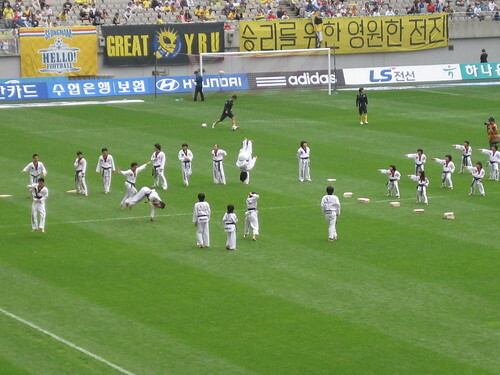 The soccer game also had an amazing half time show that consisted of some Taekwondo superstars. These kids were fantastic. If I had to choose then I would say that I enjoyed the soccer game the most because it has more consistant action. (I get bored while waiting for things to happen in baseball.) Although I would certainly go back to a baseball game too. Oh, and as a final note, North America could learn some lessons in sports pricing from Korea. Each game cost less than ten dollars.